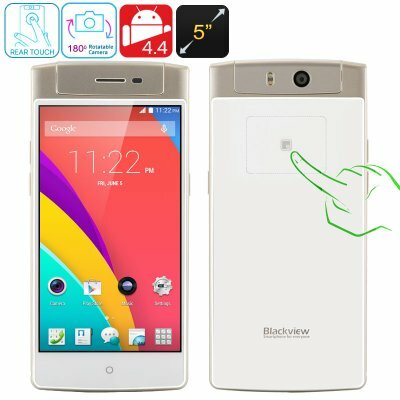 Successfully Added Blackview Acme Smartphone - Rotating 18MP Camera, 1.7GHz Octa Core CPU, 2GB RAM, 16GB ROM, Gesture Features, Back Touch Panel to your Shopping Cart. The Blackview Acme is not just a flagship phone, but one that comes with a few surprisingly useful features. Let's first get to the basics. With a 1.7 GHz octa core processor, 2GB RAM, and a 5 Inch full HD screen, this Android smartphone ranks among the best Chinese smartphones. And with our China wholesale pricing, you're getting yourself an amazing value for money cell phone. But this isn't the only thing that this device as to offer. Read further below. What's perhaps the most powerfull feature of this phone is it's 18 megapixel strong camera that can rotate to the front and back. Not only is this cool, but very useful when you want to take a picture of yourself while looking at the angle on your screen. While other smartphones have a mediocre front camera lens, you can now simply rotate the 18 MP lens to the front for better, sharper and more vibrant pictures this summer. If the camera matters the most to you, then this is the mobile phone that you should get today. Last but not least, the Blackview Acme features a back touch panel for easier control while holding the phone with one hand. The rear touch panels functions like a second screen for easier navigation.